Most home owners can replace their own failed timers eliminating the need to call expensive appliance service firms. Learn how to remove a timer. We offer risk-free service since there are no up-front fees, no handling charges and you don't pay if we cannot repair your failed timer. 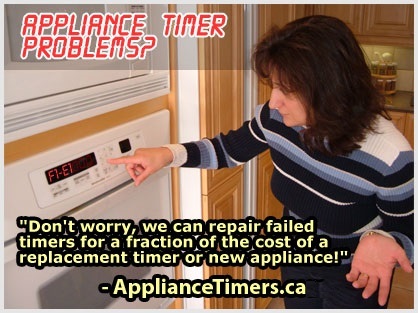 ApplianceTimers.ca has been rebuilding electronic and mechanical appliance timers and stove clocks for all popular brands of ranges (ovens, stoves), washers, dryers and dishwashers for over 40 years. Repair and Return Service - we have fixed over 1 million timers! Click on the Request Service button to get started. "Wanted to let you know I am so happy with my range clock repair!! I was a little sceptical about doing this over the internet but was so pleased with everything. Every time I look at my clock it makes me happy. Not many companies left like you where you actually fix something and it doesn't go into the landfill. This world needs more companies like you!" Read more of our 300+ Testimonials. Did you know that most new replacement timers only come with a 90-Day Warranty? We guarantee our repairs for a full year including new probems unrelated to our repairs. We repair Electronic Range timers (also known as stove clocks, oven controllers, oven displays, etc.) for all makes and models of ovens. We no longer repair electronic washer, dryer or dishwasher timers (only the mechanical variety which do not have a digital display). Admiral, Amana, Bakers Pride, Beaumark, Bosch, Brown Stove Works, Caloric, Camco, Crosley, Dacor, Electrolux, Franklin, Frigidaire, Gaggenau, Garland, General Electric, Gibson, Haier, Hardwick, Hobart, Hot Point, Inglis, Jenn-Air, Kelvinator, Kenmore, KitchenAid, LG, Magic Chef, Maytag, McClary, Miele, Moffat, Norge, RCA, Roper, Sears, Siemens, Simplicity, Speed Queen, Tappan, Thermador, Viking, Westinghouse, Whirlpool, White. We stock thousands of previously rebuilt appliance timers. 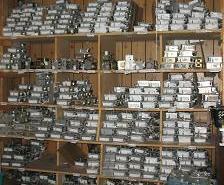 If you are in a hurry to repair your appliance we can ship you a reconditioned timer from our inventory. Our price for rebuilt timers is just about 25% more than the fee we charge to repair your timer. All we ask is that you send us your failed timer within 30 days of receiving your rebuilt timer. To find out if we have a replacement timer in stock, please call us with details of your appliance timer. Learn more about reconditioned ERC and timer pricing. We also have a few brand new replacement Thermador 486752 Timers in stock as well as new Frigidaire 318193201.